Select your cup. 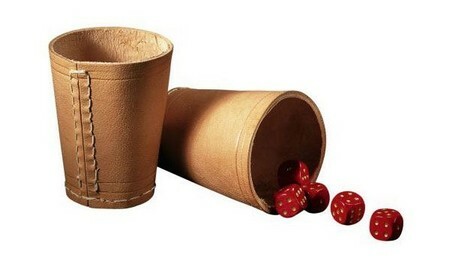 Usually, a dice cup is one that does not contain any handle. Dice cups are usually very small ones, those that can contain eight to ten ounces of any liquid. The cup you select should be light but it should also be firm. Use a file to remove the handle if your selected cup has one. A preferable material would be either plastic or wooden, in place of ceramic, glass, etc. Cut the corkboard. The use of a dice cup has a purpose to minimize the sound of your dice when it rolls in the dice cup. To ensure this, you will have to paste a corkboard layer on the bottom inside of your cup. Trace an outline on the corkboard with a pencil, of the required size. Now cut the corkboard along the shape with a paper cutter. Make sure that the cut piece of your corkboard is smaller than the outline drawn by a few millimeters to provide for the space occupied by the cup’s walls. Stick the corkboard. Use rubber cement to firmly hold the corkboard piece at the bottom inside of your cup. Put a tiny dab of the cement on the center and the corners of the cut piece. Press this onto the bottom firmly. You may even use hot glue in place of rubber cement, but there are some corkboards that melt in contact with hot glue. Create the cover. After this, comes the cover of your dice cup. Now, the cover has to be of a thick fabric to minimize the sound of your dice when it rolls against the walls of the cup. A favorable option is to use foam sheets since they are convenient to hold. However, the fabric is your choice. Cut the fabric in the required shape to fit tightly around the dice cup. Stick it onto the cup with hot glue. Decorate your cover using buttons or ribbons, or even spare fabric pieces for a design or pattern. The design is completely up to you, whether you want it to be sober or fancy. However, design the cup keeping in mind the type of game it is for. Attach felt. Now cut a felt strip such that it fits inside the dice cup very snugly. Paste it using glue. Shake the cup many times to ensure that the sound of your dice is completely minimized. If the cup is still making noise, you will have to attach more felt. Lastly, allow the glue to dry up. After some hours, you will be furnished with a dice cup to be used with any game you and family or friends want to play.